Romar celebrates Washington's 2011 Pac-10 Tournament championship. Lorenzo Romar (born November 13, 1958) is an American basketball coach and former player. He is the head men's basketball coach at Pepperdine University, a position he held from 1996 to 1999 and resumed in 2018. Romar also served as the head men's basketball coach at Saint Louis University from 1999 to 2002 and the University of Washington from 2002 to 2017. Romar played college basketball for Washington from 1978 to 1980. After college, he was drafted by the Golden State Warriors and spent five years playing in the National Basketball Association (NBA). After the NBA, Romar played and coached for Athletes in Action. Romar was then hired as an assistant coach at the University of California, Los Angeles (UCLA) under head coach Jim Harrick from 1992 to 1996, and was credited with recruiting many of the players on the 1995 national championship team. 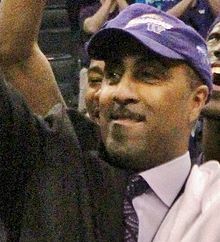 Romar became the head coach at Pepperdine University and then at Saint Louis University before taking the job at Washington in 2002. Romar is credited for turning around the sagging fortunes of the University of Washington basketball program and generating new enthusiasm for the program. In 2004, Washington qualified for the NCAA Tournament for the first time in five years. In 2005, Washington won the Pac-10 Tournament and received a No. 1 seed in the NCAA Tournament. The Huskies made their way to the Sweet Sixteen for the first time since 1998, but were ousted by Louisville. In 2006, Washington earned a third consecutive NCAA Tournament appearance and advanced to the Sweet Sixteen for the second consecutive year. After failing to make the NCAA Tournament the next two years, Romar was named Pac-10 Coach of the Year for leading the Huskies to their first outright conference title since 1953. They earned a No. 4 seed in the NCAA Tournament, but lost in the Second Round. The Huskies returned to the Sweet Sixteen the following year, but again lost. In 2011, the Huskies earned their third consecutive trip to the NCAA Tournament. The trip marked the Huskies' last trip to the Tournament under Romar. With a season-opening win over South Carolina State on November 14, 2014, Romar passed Marv Harshman to become the second-winningest coach in UW history. After four years of near .500 seasons and five years without an NCAA Tournament appearance, Romar's luck seemed to be turning around. In 2016, Coach Romar recruited his long-time friend Michael Porter Sr. to join the Huskies as an assistant coach. Michael Porter Sr. was expected to bring his two sons, Michael Porter Jr. and Jontay Porter, as commits to Washington. Michael Porter Jr. is widely considered the No. 1 recruit in the 2017 class. However, on March 15, 2017 following a dismal 9–22 season with future #1 pick Markelle Fultz leading the team, Romar was fired as head coach at Washington after 15 years. Romar's record at Washington finished at 298–195. He made six NCAA Tournaments and three NITs, but had not made the NCAA Tournament in six straight years. On April 16, 2017, it was announced that Romar had joined Sean Miller's staff at Arizona as associate head coach. On February 24, 2018, Romar was the interim head coach for one game after news broke the previous day that the FBI had reportedly intercepted phone conversations about Miller talking about paying Deandre Ayton to come to Arizona. Ayton would be the second straight #1 pick to be coached by Romar for at least one game. Romar was announced as the new head men's basketball coach at Pepperdine on March 12, 2018, returning for his second stint with the school. Romar is known by his fellow coaches as one of the top basketball recruiters in the country. Additionally, he is respected as a genuine and optimistic person and was once voted "the opposing coach players would most like to play for" in a Pac-10 poll. In March 2006, Romar was given the prestigious Coach Wooden "Keys to Life" award for outstanding character. Romar is married to Leona Romar, with whom he has three daughters—Terra, Tavia and Taylor. In 2006, Lorenzo Romar and his wife Leona founded the Lorenzo Romar Foundation for the prevention of domestic violence and educational assistance for disadvantaged youth as well as other charitable causes. All players in this section were coached by Romar for one game in the 2017–18 NCAA season (that game being on February 24 against Oregon). The players that were coached by him during that game and were drafted or had played in the NBA go in this section. ^ "Pepperdine officials welcome back Lorenzo Romar for 2nd stint as coach". www.seattletimes.com. The Seattle Times. March 12, 2018. Retrieved April 5, 2018. ^ Allen, Percy (April 19, 2010). "Washington's Lorenzo Romar agrees to 10-year contract extension". www.seattletimes.com. The Seattle Times. Retrieved April 5, 2018. ^ Pascoe, Bruce (February 3, 2018). "Seen and heard at Hec Ed Pavilion: Lorenzo Romar's standing O, Dawg Pack poetry, Washington is 'Tougher Together'". tucson.com. Arizona Daily Star. Retrieved April 5, 2018. ^ "Top basketball recruit Michael Porter Jr.'s father lands assistant job at Washington". The Seattle Times. May 6, 2016. Retrieved March 16, 2017. ^ "ESPN Basketball Recruiting - Player Rankings". ESPN.com. Retrieved March 16, 2017. ^ "Washington fires Romar after 9-22 season". ESPN.com. Retrieved March 16, 2017. ^ Kolloen, Seth (March 15, 2017). "The Rise and Fall of Lorenzo Romar". www.seattleweekly.com. Seattle Weekly and Sound Publishing, Inc. Retrieved April 5, 2018. ^ "Lorenzo Romar hired as Arizona associate head coach". CoachesDatabase.com. Retrieved April 17, 2017. ^ "Sean Miller won't coach Arizona's game Saturday vs. Oregon". www.espn.com. ESPN. February 24, 2018. Retrieved February 24, 2018. ^ "Lorenzo Romar to Return as Basketball Coach". www.pepperdinewaves.com. Pepperdine Athletics. March 12, 2018. Retrieved March 12, 2018. ^ "Lorenzo Romar to Return as Pepperdine Men's Basketball Coach". www.pepperdine.edu. Pepperdine University. March 12, 2018. Retrieved April 5, 2018. ^ "Lorenzo Romar Bio". www.gohuskies.com. University of Washington Athletics. Retrieved April 5, 2018. ^ Hansen, Greg (April 8, 2017). "Three ways Lorenzo Romar could help Sean Miller, Arizona Wildcats improve". tucson.com. Arizona Daily Star. Retrieved April 5, 2018. This page was last edited on 10 April 2019, at 18:07 (UTC).